A couple of years ago, when my big brother and sister-in-law were visiting me in Spain, we drove down the road from where we were staying to one of the many smaller cities in Spain which have no profile in the outside world. Madrid, Barcelona, Seville, Valenica, and then you start scouring your memory for other possible places. The small city in question was Aranda del Duero, right dab in the middle of wine country. We loved it, came away with very pleasant memories, particularly of the friendly people and the pastry shops, and I couldn’t get over how clearly the Arandinos speak Spanish. I understood everything. Today I am going to do what I planned to do back then; devote a post to one of these many smaller cities that I have enjoyed. In this case, it is Girona, 100 km north of Barcelona in the heart of Catalonia. I have visited it four times; I have just spent four days and decided savouring its atmosphere. I did publish a post about the very enjoyable festival parade I happened upon most fortunately, a highlight of my holiday. It is an ancient city, an important Roman post but most likely built upon an earlier Celtiberico settlement. Many here will have centuries-old roots; they know who they are, they are not recent arrivals trying to find themselves, trying to carve out a life and identity. 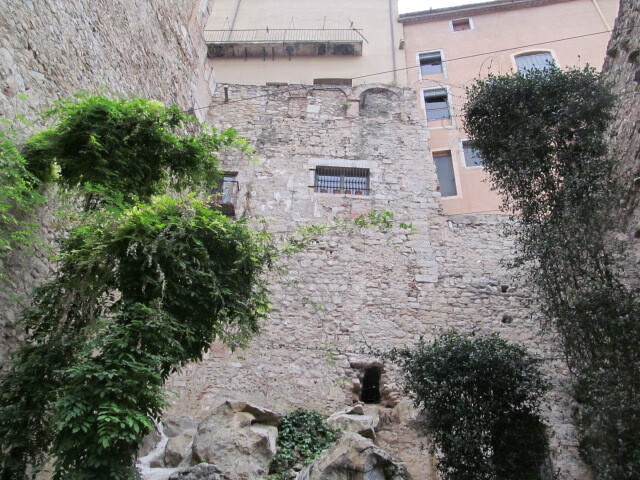 Some of the medieval walls and at the bottom of the photo, you can see some of the rock that the city is built upon. Narrow streets, filled with people, lined with shops and cafes, a labyrinth of delight to wander through and allow yourself to get lost. 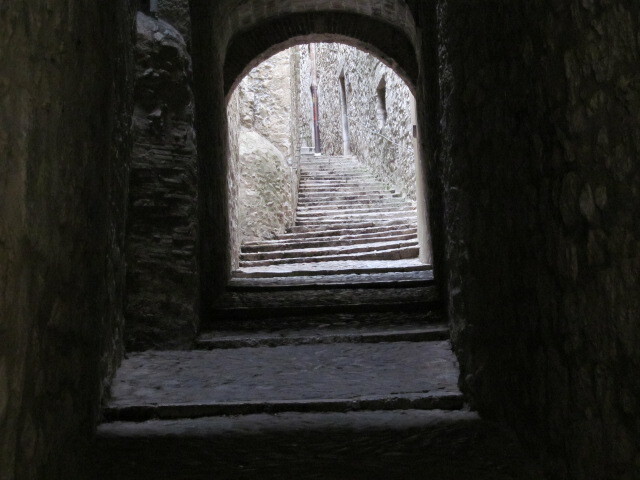 It is interesting to speculate on all those who have climbed this narrow passage through the centuries, who they were, where they were heading to on such-and-such a day, etc. A charming little corner, a chocolate shop, an ideal spot to savour Girona and the speciality of the house. 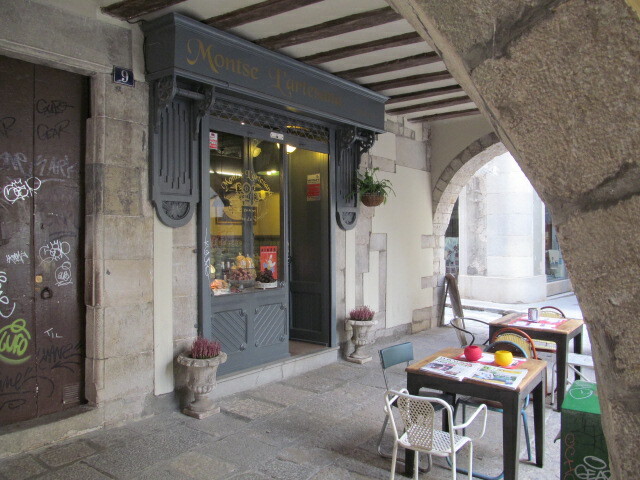 A bit of whimsey; I ate lunch at this Creperie de Bretonne in the heart of old Girona. 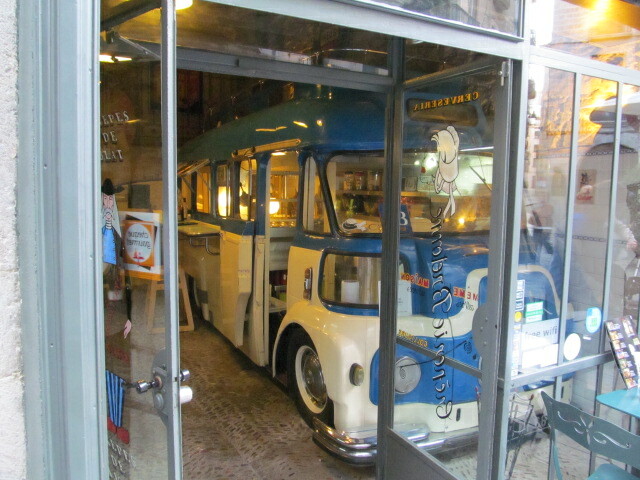 In the fifties a woman arrived from La Bretagne and started creperies in a number of cities here, each of which has its iconic old bus within the walls; iconic but also where the desserts are put together. I enjoyed a great salad and what I thought was a mushroom and cheese crepe; it was but it came with rashers of bacon on top. Did they know I was Canadian? I ate outside, of course. 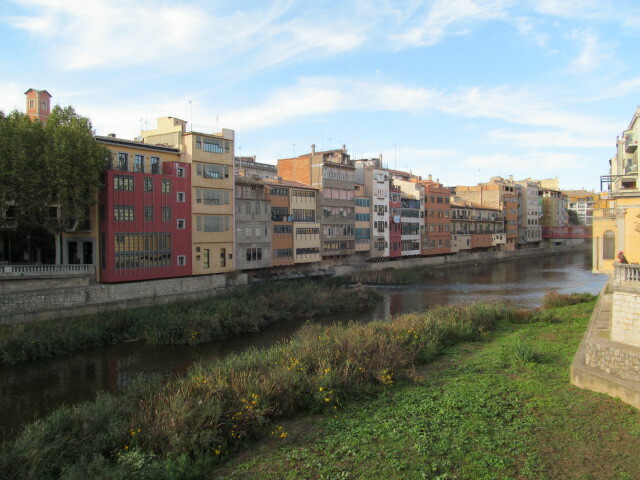 Emblematic of Girona are their colourful houses along the river. I do have better photos of this back home. 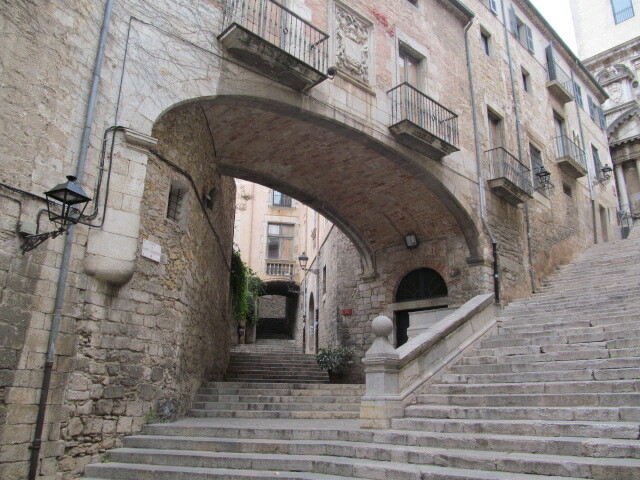 There is also a more modern Girona. I like getting beyond the tourist quarter and wandering in the neighbourhoods where real people live, the residents who get up every morning (eventually) and go to work. I came across a beautiful park about a kilometre from downtown, complete with a small lake. 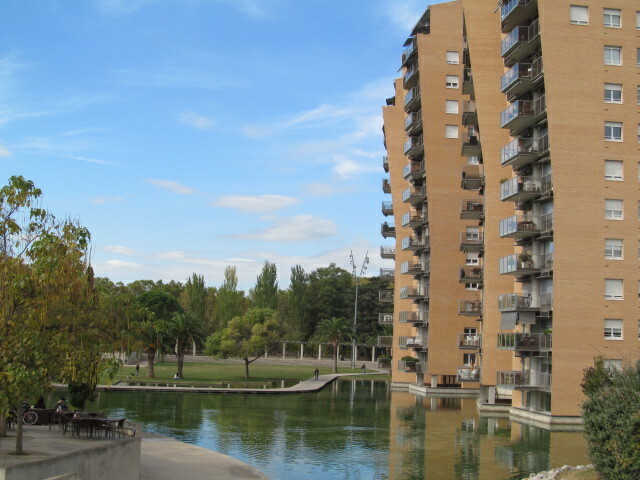 The apartments overlooking the lake are typical of contemporary urban architecture across this country, of a reasonable height and visually interesting. 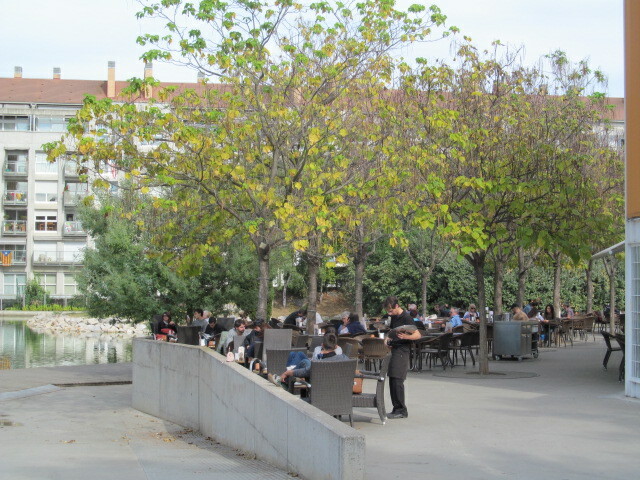 To the left, overlooking the lake, is the coffee shop. Sorry, Alternative Grounds, you cannot compete with the location; your clientele, though, is much more interesting. Could you handle this every morning? But the Spanish don’t stay in their coffee shops. They drink, chat a bit and carry on. I am sure though that some of these cafes have their morning regulars, their Pats, Rajés and Philips, among others. Will any have such interesting baristas as we do? I will sign off with a curiosity for you and what was a delightful discovery for me. There is some stunning Romanesque architecture here, from the 11th and 12th centuries. 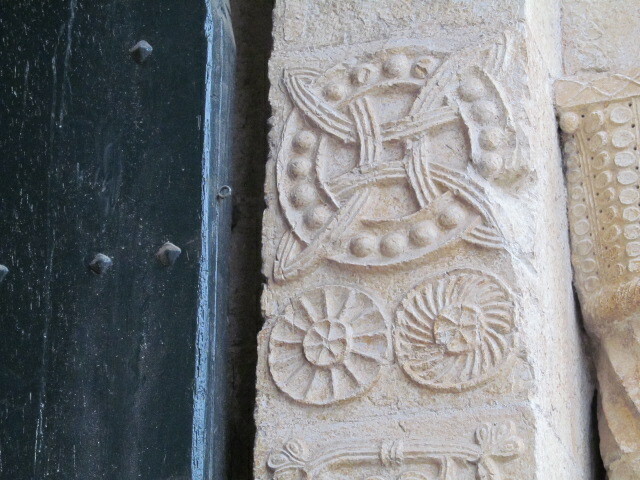 In the arches of the main door of one of these churches, now a museum of archaeology (I’ll use that word again, “amazing” – I have visited it twice and they are improving it each time), there is a great variety of motives, of symbols, most of which are easily identifiable as Christian. But the ancient pagan symbols intrude, the Celtic symbols that we associate with Ireland are present. Like the spirals of New Grange in Ireland. 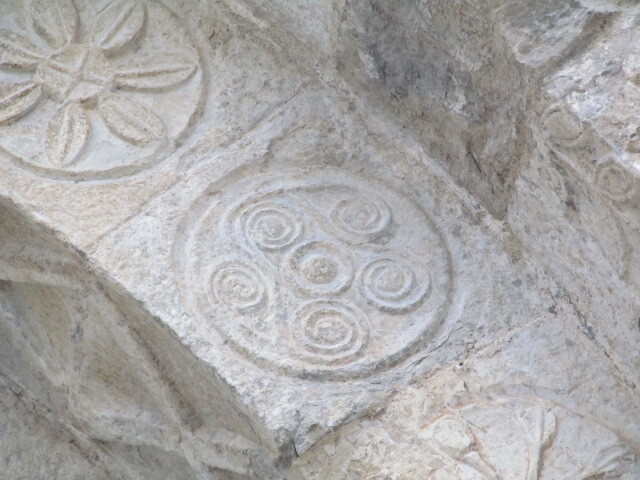 And here is another Celtic motif, the solar symbol of the cycle of life, the bottom right. I have seen this solar symbol on a large altar frontal stone in a tiny 10th century church up in the foothills of the Pyrenees, Santa María de Liébana). Each age appropriates and adapts what has been handed down. And Christianity has been particularly adept at adopting and adapting a wide range of so-called pagan symbols and practices. I have to do some searching to understand better the larger symbol above the two smaller ones. I have seen variations of it and the old head is forgetting what it could mean. My final post in a few days will be from Barcelona where I am spending five days savouring it and repeating to myself what will be the title of that post – I could live here! Enjoy and keep those comments coming! This entry was posted in Uncategorized on November 3, 2013 by agnotarte. Beautiful Ed. If you ever find the meaning of those symbols, I’d be very interested to know!